Namibia is a mostly arid nation, although wetter grasslands and savannas predominate in the northeast. Angolan Mopane Woodlands in Namibia. Namibia, officially known as the Republic of Namibia, is located in the southern part of Africa. Its capital and the largest city is Windhoek. It borders four counties namely; Zambia, Angola, Botswana, and South Africa. It was colonized by the German empire in the 19th Century, but South African forces overthrew the empire in 1915. On March, 21st 1990, Namibia gained its independence from South Africa. It is the 34th largest country in the world with an area of 318,772 square miles and a population of approximately 2.1 million. It is located between two deserts in the sub-Saharan region of Africa; the Kalahari and Namib deserts. Angolan Mopane Woodlands is an ecosystem extending from the southwestern part of Angola to the north of Namibia. It is composed of Tropical and Subtropical Grasslands, Savannas, and Shrublands which are widely spread in regions such as the Omusati, Oshana, Kunene, and Oshikoto. The landscape is flat and rainy seasons are rare in late summer. The main type of vegetation found here are the mopane trees also known as butterfly trees because of the shape of its leaves. Several mammals including carnivorous such as lions and leopards are found in this ecosystem. Etosha is a national park located in Kunene region. It was established in 1907 as a game reserve but was elevated to a national park in 1967 by an act of parliament of South Africa. It covers an area of 8600 square miles and is home to several species of mammals, birds, and reptiles. This park has a savanna desert climate with extreme temperatures in both summer and winter. Vegetation types found here are; the saline desert, the savanna woodlands, the dwarf shrub savanna and grasslands in the sandy soil. Its Biome is Zambezi freshwater from river Zambezi. Namaqua is a national park located in the Northern Cape Province, South Africa near its border with Namibia. The park has an arid (semi-desert) environment with hot and dry summers, cold winters, generally sparse rainfall, and high precipitation from May to August. Succulent plants thrive in this ecosystem and are adapted to retain water in dry conditions. The park stretches along the western coasts of both Namibia and South Africa, with over 5,000 plant species in this biome of Atlantic Marine. The Kalahari Desert is a large semi-arid sandy savannah in the southern part of Africa extending across three countries namely; Botswana, Namibia, and South Africa and covers an area of 350,000 square miles. Small amounts of rainfall are evidenced, but in summer, temperatures are very high. 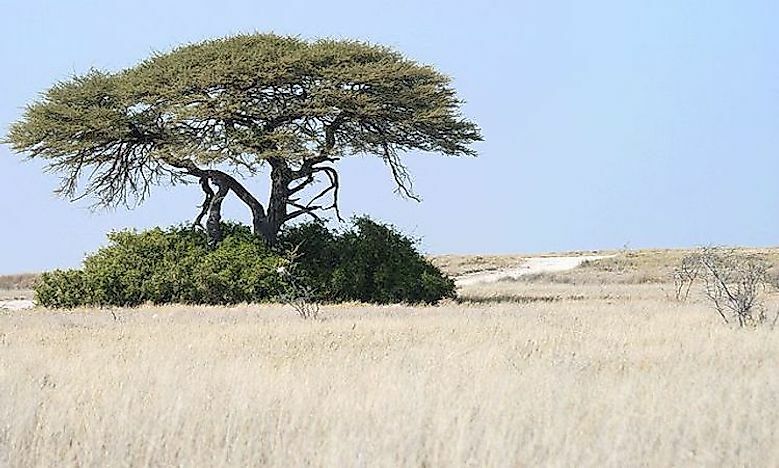 Despite the harsh environmental conditions, some native plants like the Acacia are found, few endemic species and a variety other animals. . Endemic fauna and flora of the Angolan Mopane Woodlands face a threat of extinction due to the clearing of the woodlands and grasslands for agriculture, timber, or firewood.The Namaqua is a threatened biodiverse ecoregion with endemic reptiles and several plant and flower species which are under protection by the government.The animals of Kalahari face major threat due to the clearing of their habitat and grazing fields for agricultural activities by humans. The expansion of the Namib and Kalahari deserts is also a major threat to the ecoregions.